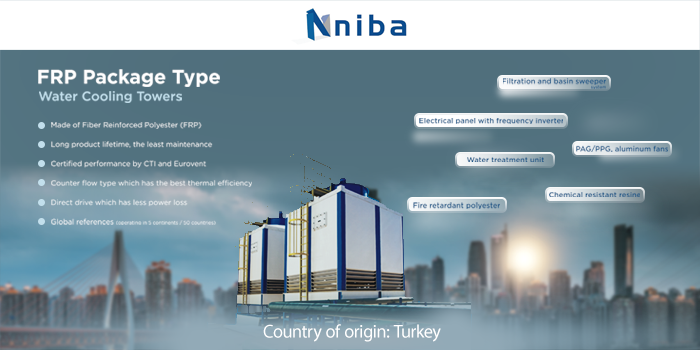 MIA Corporation (Pvt) Ltd is a subsidiary of MIA Group of companies, which caters to the large commercial and heavy industrial customized air-conditioning market in Pakistan. With a business network spread across 9 cities in Pakistan, MIA Corporation offers the internationally recognized Daikin, McQuay, Marley, Thermax, Carel and Clint brands for the commercial market. In 2015, MIA Corporation launches the world renowned Air-Conditioning brand in Pakistan, Daikin. The air conditioning offered by Daikin caters to all types of large commercial heavy industrial customized air conditioning needs of the market. MIA Corporation proudly introduces Daikin all across the country for the first time in a decade. Daikin is a leading Air-Conditioning brand meeting a wide range of air conditioning needs across the globe. One of the big names in air conditioning, Daikin offers air conditioning from domestic to light commercial to district level spaces. Daikin is credited with co-developing R-410A refrigerant with Carrier and is an innovator in the Split System Air Conditioning Market. Daikin is also the inventor of Variable Refrigerant Flow (VRF) air conditioning systems (These systems are copywriter as Variable Refrigerant Volume or VRV by Daikin). MIA Corporation now introduces the large commercial and heavy industrial air-conditioning range from Daikin for the first time in Pakistan. Available from 4 ton to 400 tons, the Daikin VRVs, Air cooled chillers, water cooled chillers, rooftop packages and packaged air conditioners cater to the large commercial and industrial customized air-conditioning needs of the market. Energy Saving: Outdoor units can operate up to 4.41 COP to reduce energy consumption. Large Capacity and Space Saving: Outdoor units with capacities up to 56kW for a single outdoor unit and 168kW for a 3-unit combination are available. Featuring compact size and small footprint, VRV outdoor units enable space-saving and easy installation. Flexibility: Increasing high static pressure for the outdoor unit fan gives greater installation flexibility. High Reliability: The addition of various advanced features ensures reliable and stable system operation. Providing Exceptional Quality Equipment and service to power generation, industrial, refrigeration and HVAC markets, Marley continuously developed its position as world’s only cooling Tower Manufacturer from the first cross flow cooling tower in 1936 to first hyperbolic natural draft in North America in 1962, the name was changed to SPX Cooling Technologies, Inc. in 2005. CAREL offers innovative humidification and control systems in the HVAC/R market. BMS (Building Management Systems) are for the integrated management of all technological functions of a building BMS include access control, safety, fire detection, lighting and Air Conditioning. Advantage is reduction in running costs. 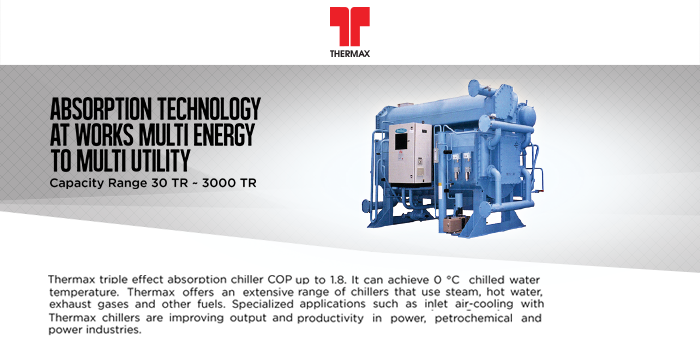 Thermax is one of the leaders in vapor absorption cooling systems. As a global player, Thermax has singularly focussed on improving absorption-cooling technology from the twin angles of reliability and efficiency. Thermax VAMs are extensively used in a variety of industries as well as commercial buildings for process-cooling and air-conditioning. Thermax excels in integrating energy systems to provide total solution to the customer gives us the cutting-edge over other players. Marley continuously developed its position as the world’s only full line Cooling Tower manufacturer – From the first cross flow cooling tower in 1936 to the first hyperbolic natural draft in North America in 1962 and parallel-path wet-dry hybrid cooling tower in 1971. SPX Corporation acquired Marley Cooling Tower in 2001. In 2005 Marley’s name was changed to SPX Cooling Technologies, Inc. and it continues to manufacture, sell and service Marley brand cooling towers, parts, and accessories. Made of Fiber Reinforced Polyester (FRP). Long product lifetime, the least maintenance. Certified performance by CTI and Eurovent. Counter flow type which has the best thermal efficiency. Direct drive which has less power loss. Global references (operating in 5 continents / 50 countries). High Technology equipment requires a high level of sophistication and requires highly precise environmental controls including temperature, Humidity, Air Quality to ensure continual and reliable performance. The CITEC CL range of Air Cooled, Chilled Water and Water Cooled air conditioning units are designed to provide the ultimate in precise control of temperature, humidity and filtration in the most demanding environments. The concept is based on the reliability, efficiency, flexibility and serviceability, the hallmark of all CITEC equipment. MIA Corporation is a part of MIA Group, which offers commercial & industrial air-conditioning products & services.